I received this email from the Nutrition Council of Greater Cincinnati, and instead of trying to paraphrase and reproduce the helpful links embedded within it, I've pasted the communication within this post. 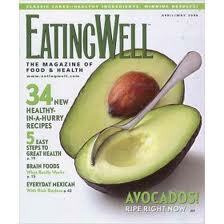 Be sure to check out their link "50 ways to eat more fruits and vegetables," below. Also note that their annual Food on the Run Fitness walk/run is this Saturday, March 3rd -- scroll down for the details. It's almost time to Get Your Plate in Shape to celebrate National Nutrition Month! Read on to find out the hottest topics in nutrition for March. Build a healthy plate. Start with more vegetables and fruit, add smaller portions of proteins and grains. Here are more tips to get your plate in shape. Use the online supertracker to track your daily food intake and physical activity. Visit www.choosemyplate.gov for more information. Join us for our annual Food on the Run 10K & 5K Run/Fitness Walk on Saturday, March 3rd. Register online no later than Thursday, March 1st at midnight. We recommend participants carpool, we are expecting 1200 runners/walkers. Parking is available for $4 at Yeatman's Cove and other lots. For more information or to get involved contact Jane Boback or visit our website. With so much wealth clustered on the east-central side of Cincinnati, you'd think there would be better dining choices, or at least more interesting and inventive ones. But Hyde Park, Indian Hill, Oakley and Walnut Hills have a lot more chain restaurants (Bonefish Grill, PF Chang's, J. Alexander's, First Watch, Chipotle and the like), casual diner style spots (Arthur's, Hitching Post), or mediocre Thai/Asian places than independent eateries. The ones that are there are either limited in scope (Essencha teahouse, great at what it does) and/or tired (Teller's) or are about to exit from the area (Boca, Hugo's). That's a long intro to bringing up a new restaurant in O'Bryonville that is packing people in -- grateful, no doubt, for the excitement of a place worth seeking out. Enoteca Emilia couldn't be more welcome to the area. Owned by a couple who used to run the bistro at Joseph-Beth bookstore in Rookwood/Hyde Park, the former home of several failed concepts seems to be firing on all cylinders and boasting packed houses most nights. 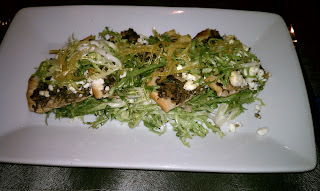 The food is relatively casual but well executed -- Italian, and mostly small plates. We had a couple of meat skewers (lamb for me, chicken for my husband) and split a couple of excellent side dishes -- roasted cauliflower and a cold faro salad with beets and mint. Everything was delicious and we loved the feel of the place -- very lively and with a friendly and happy vibe. My husband declared this his new favorite restaurant. Light dining, with great drinking! My favorite restaurant (not counting the high-end, once-in-awhile options) is La Poste in Clifton, Cincinnati. 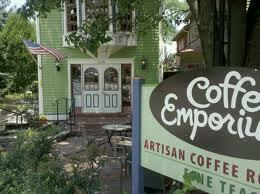 Happily, Clifton is my home 'hood and the restaurant is about a 10-minute walk from our house. The food is good at La Poste, but the drinks are stellar. 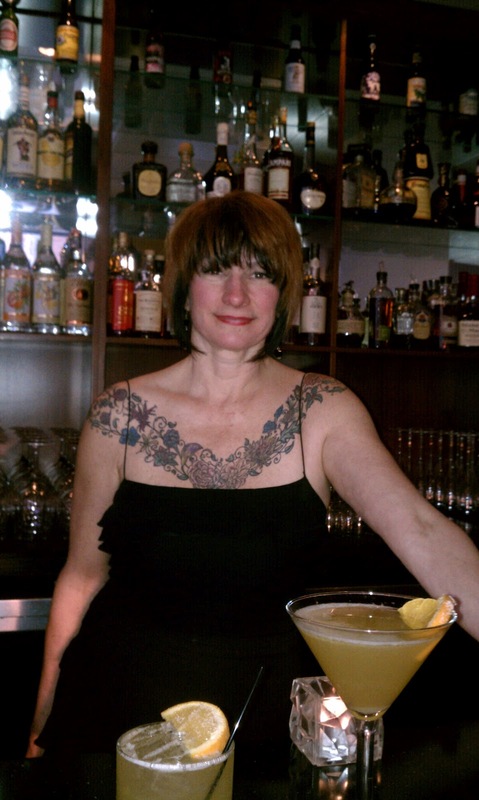 In addition to perhaps the best, most extensive and most adventurous wine list within a 200-mile radius, head bartender Suzy whips up some delicious cocktails. She's not satisfied doing the same things over and over, so every couple of months she creates a new list of about 10 fun drinks. On her latest list, the "Hot Manhattan" is my favorite so far. I can't tell you the ingredients -- figs are involved, as well as a bit of Amaretto and of course bourbon -- but it has a kick from chili peppers that is just right. Not too spicy but enough heat to give it a great aftertaste. 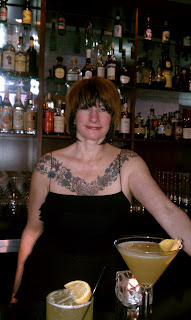 Here's a photo of Suzy with a couple of her drinks. For my meal, I just had their flatbread appetizer. They usually have a flatbread option but the one on the current menu is the best so far. It's lighter than most, with only a sprinkling of goat cheese. The crispy, cracker-like bread is topped with a mushroom spread, candied lemon peel, the goat cheese and frisee salad. Believe it or not, it was plenty of food. Another time I went with my husband and we split the flatbread as an appetizer. I had the roasted pear salad and he had a salmon entree, rounding out the meal. Try emphasizing whole grains, vinegar and nuts -- and get rid of that spare tire. So says Eating Well. Here are some tasty and easy recipes that include filling foods that contain these stomach-reducing ingredients....for example, this couscous salad. Instructions: Whisk oil, orange juice, vinegar, shallots, salt and pepper in a large bowl. Add cooked couscous, nectarines, berries and almonds; gently toss to combine. Ever since I started working out with a personal trainer a few months ago, I've been a lot more conscious of reducing starchy foods (pasta, potatoes, bread, and rice) and upping the amount of protein I eat every day. Yes, I often supplement food sources with a helping of low fat protein powder dissolved in water, but here are a few really great ways to enjoy protein on a daily basis. Yogurt (especially Greek) -- buy nonfat or low-fat plain, add vanilla flavoring and a no-cal sweetener if you want. I have it for breakfast with berries, half a banana, chopped walnuts and a couple tablespoons of granola for crunch. It's become my favorite breakfast. Almond butter -- almonds are so much more nutritious than peanuts, and while like most folks I love (chunky, unsalted) peanut butter, almond butter is a better choice. Spread it on apple slices or celery sticks to avoid the starchy bread or crackers that we tend to put our nut butters on. Quinoa -- instead of rice, couscous or pasta, this grain is a great source of protein, and it's just as satisfying to the soul as those other, starchier grain products. 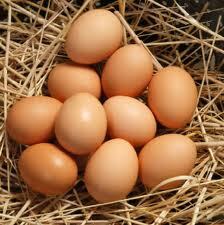 Eggs (especially organic) -- the ultimate fast food because they cook in no time. I don't bother with them for breakfast but at lunch I enjoy a couple of eggs scrambled with cooked veggies, perhaps some leftover chicken or salmon, and a sprinkle of cheese. A quick fritatta or omelet also makes a nutritious supper. 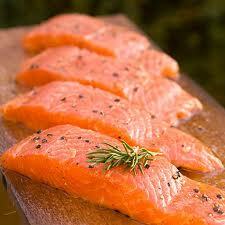 Wild salmon and other wild (not farmed) fish -- we eat fish for dinner at least three times a week. It cooks very fast (like eggs) in a frying pan with just a bit of oil. One of our go-to meals. Organic Chicken and Grass-Fed Beef -- one of my healthy-foodie rules is "no supermarket or fast-food meat," if only because I am offended by the inhumane treatment of animals by our industrial food system. We don't eat beef of any kind very often, to tell you the truth, and prefer ground bison (buffalo) in chili, sauces and as burgers. Hummus -- made from protein-rich chickpeas (garbanzo beans), I like the chipotle flavored kind by Trader Joe's, and also the Luscious Lemon of another brand. To avoid a starchy bed for this spread, I have it with carrots and celery, usually. This won't be news to anyone who loves coffee and lives in Cincinnati, but Coffee Emporium is the king of the Queen City when it comes to the bean. It's probably because they roast their own at the downtown (OTR) location. Man, the stuff is good. OTR has more indoor seating than does Hyde Park, but the parking is so expensive down there that it's hard to a) find a space at all during weekday mornings, and b) spring for the pricey meters if you do get one. The Hyde Park locale is wonderful in warm weather because of the many outdoor spots, in front of and behind the cute house where you get your coffee, pastries, etc. I'm there right now, about to grade a batch of papers while enjoying a superb mug of capuccino. 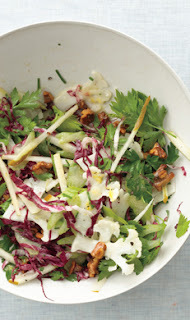 This crunchy, healthful salad was featured on Epicurious recently. Push cauliflower florets, then radicchio, through the feed tube of a food processor fitted with a slicing disk, or thinly slice cauliflower on a mandoline and radicchio with a knife. Mix in a large bowl. Peel rounded side of celery with a peeler to remove strings. Remove leaves; add to bowl. Thinly slice stalks with a knife; place in bowl and add chives and parsley. Finely grate zest from whole lemon directly over the bowl to catch any citrus oil. Toss to mix well. Squeeze juice from lemon for dressing. Place 1 tablespoon juice in a small bowl. Whisk in Dijon mustard. Gradually whisk in oil. Season with salt and pepper. Up to 1 hour before serving, add dressing to salad; toss to coat. Season salad with salt, pepper, and more lemon juice, if desired. Cut pear into matchstick-size pieces. Add pear and walnuts to salad; toss to combine. Reverting to the Old Ways (Unhealthy habits)? Readership for this blog always spikes in January. After the holidays, so many people want to shape up and make changes in their diet and exercise routines (or lack thereof), blogs such as mine get on more folks' radar. But by the time the Super Bowl rolls around, my daily hits start to drop off as we go to parties and gorge on chicken wings (does any less healthy food exist?) and cheesy dips. So much for the New Year's Resolutions. Now it's mid-February and my readership is half what it was a month ago. I find it discouraging, as you might be able to guess. 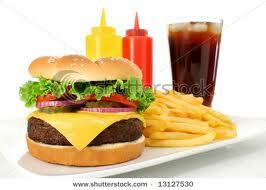 However, we must soldier on -- healthy foodies unite! There are lots of food reads on the newsstand, but if you want to narrow it down to just a couple of really good ones, here are my picks. The first two are for cooks -- for anyone who wants to enjoy delicious food at home while sticking to an overall goal of staying fit and healthy. They not only contain great recipes but they also have informative articles about the relationship between food and health. The third one on my list is just a wonderful read every month and is one of my favorite things that comes in the mail. Unlike the first two, it has a welcome focus on wine, and on top of that includes fascinating pieces on travel, from a foodie perspective. 1. Eating Well takes very little advertising, is beautifully designed and produced, and strikes a pleasing balance in its approach to food by leaning heavily towards health-oriented recipes without going overboard toward asceticism. The articles about food trends, including an encouraging emphasis on sustainability and environmental responsibility, makes this magazine a standout. 2. 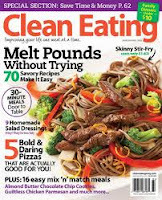 Clean Eating is a relaitvely new discovery for me, but it's become a solid favorite after just a few issues as a subscriber. This one is less available on newsstands, at least around where I live, so you almost have to subscribe to keep up with it. The health orientation is a little more strict than with either of the two others, and many of the articles focus on coping with diet-influencing health conditions such as diabetes or gluten intolerance. Worth a look! 3. 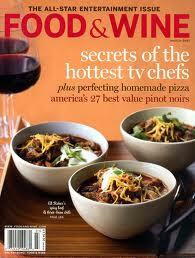 Food & Wine is my absolute favorite among the mainstream food mags. Although many of the recipes are too rich for my kitchen, it's possible to make lighter versions with a few substitutions here and there. I've gotten a lot of great ideas from this magazine. And I really love the wine articles and travel pieces, some of which I rip out and save for our own roamings. We fell totally in love with these flavors. (One secret: sneak just a little bit of butter in the braising liquid.) We had it as a side dish with broiled fish, and had leftovers to enjoy later. For vegetarians, don't use chicken broth in the braising liquid, and consider this dish as a main course, accompanied by whole grain bread and a green salad. Prepare the braising liquid in a large, deep sided frying pan: add the liquids along with the garlic, chopped onions, herbs, butter (if using) and seasonings. Cover and bring to a boil. Arrange leeks and quartered fennel in the pan. Bring liquid back to boiling, then reduce heat to low, cover and cook until vegetables are tender, about 15-20 minutes. Meanwhile, in a smaller frying pan, heat olive oil over medium and add mushrooms. Stir-fry for 3-4 minutes, add salt and pepper and remove from heat. To serve, carefully remove fennel and leeks to a platter; top with sautéed mushrooms. Note: Strain the braising liquid to remove solids and store broth in the refrigerator for another use—it will be quite flavorful. Preheat oven to 400 degrees. Coat a large baking sheet with cooking spray. In a shallow dish, combine the flour, salt, and pepper. Mix with a fork to combine. In a separate shallow dish, combine milk and liquid smoke. In a third shallow dish, combine breadcrumbs, oats, and garlic seasoning. Dip chicken into flour, and turn to coat both sides; shake off any excess flour. Transfer chicken to milk mixture and turn to coat. Transfer to the breadcrumb-oat mixture, and turn chicken to coat. Place chicken on prepared baking sheet, and spray tops of strips with cooking spray. Bake for 25 minutes, until the crust is browned. What to eat during the Super Bowl?